Summary: This project involves the purchase of supplies associated with medical care as well as food for the continued aftercare of Florida’s gulf coast sea turtles. CROW is the only facility on the gulf coast between Sarasota and the Florida Keys that provides care and rehabilitation for sea turtles. 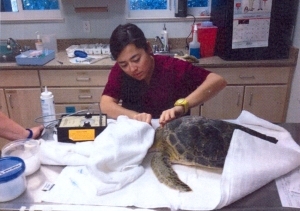 As such, it provides critical services to injured and ailing gulf coast sea turtles on an ongoing basis. Of all the species treated at CROW, sea turtles are, by far, the most costly. Several years ago, recognizing the importance of immediate medical attention for sick or severely injured sea turtles, the Florida Department of Fish and Wildlife recommended that CROW become a center for treatment. A turtle facility was built in 2000 on the CROW grounds and clinic staff have regularly provided care for Loggerhead, Green and, the most endangered, Kemp’s-Ridley Sea Turtles. Throughout the last three years, CROW has rehabbed 73 sea turtles It is projected that we will care for more than 30 sea turtles in 2013. Results: CROW continues to provide high quality treatment and rehabilitation for Florida's gulf coast sea turtles. Although they arrive at CROW in various states of injury or illness, the overriding goal is to return each patient into their natural habitat. Throughout the grant cycle, CROW has seen 29 sea turtles come through the hospital, 13 Kemp's Ridley, 10 Green and 6 Loggerheads. Of them, three were hatchlings. CROW was able to treat and release 41% or 12 of the turtles seen during the grant cycle. One was transferred to Mote Marine in Sarasota. Six were dead on arrival. Four died during treatment, and six were so ill or injured that they had to be euthanized. The presenting conditions of the sea turtles include fibropapillomatosis, brevetoxicosis, boat strikes, fish hook or line entanglement, anemia, pneumonia, and sepsis.